What Would Mike Do? 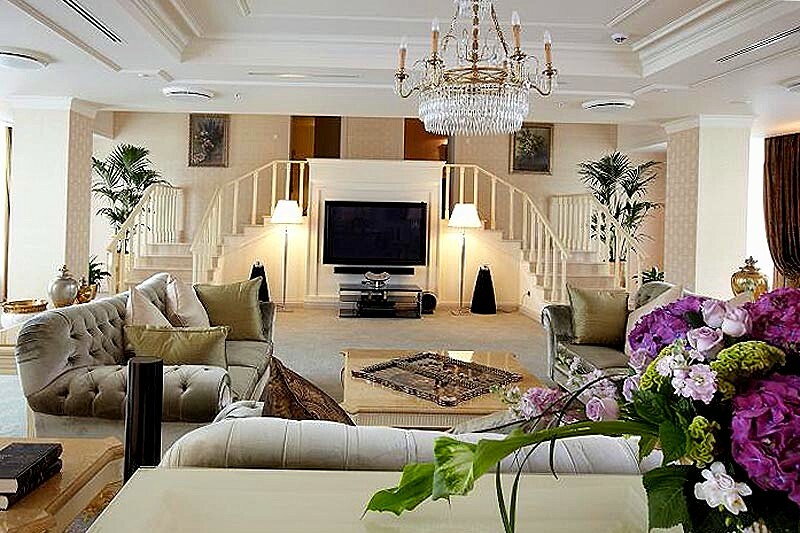 : The hotel blog: Why can't many hotel suites, including presidential suites, be booked online? What I'll do is price it so that the nightly rate is worth doing for you, but with a catch: what we call a 'minimum length of stay' requirement (MLOS). Let's play make-believe: you're traveling with your family, you show up in the hotel I'm going to use as an example, you'll need two rooms, so you'll want a one-bedroom suite if you're going to stay only a few days, a two-bedroom suite if you're going to stay longer. My double queen rooms (actually, this is an 'all-suite' property but most of the 'suites' are the 'shotgun suites' like I describe below, so all they are is a standard hotel room with a slightly separated sitting area that includes a sofa bed, and a mini-kitchen . . .) in this sample property go for $96 to $102 per night. I'll give you a one-bedroom suite for $149 per night. Or I'll give you our two-bedroom suite for $209. But in order to get it at that rate, you'll have to be staying a minimum of three nights. I need to have it rented for that long in order to justify the 33+/-% 'discount' from what you'd pay for two or three rooms. If you (or your travel agent) tried to book it on my website, the first thing you would be asked is, how many nights do you intend to stay? If you entered 'one' or 'two' nights, neither of those suites would show up as available at all. At that price, they aren't. It's a common practice. That's why, on the Marriott website, for example, you'll see certain types of suites show up as 'not available' if you plan a stay of only a few nights, but available if you plan to take them for several days. It doesn't have to be 'big' suites, or 'luxury' suites. A TownePlace by Marriott in a certain location, for example, might have high normal demand for its studio suites, but not as many takers for its one-bedroom suites, so they'll put the MLOS on the studio suites, and get a high nightly rate for its one-bedrooms. The 'drop' helps us: while it takes a half hour for a room attendant to make a room for the next guest, she can service a stayover in ten to fifteen minutes, doing spot cleaning, replenishing the towels, maybe making the bed, changing the linens only every three days. So we're just passing the savings on to you, while keeping our higher priced units rented. Our new, independent brand has the pricing model for even its regular rooms set up the same way. Depending on the market, you get an automatic discount of ten percent more or less for a stay of three or four nights - three nights if you show up on a Sunday, Monday or Tuesday, four nights if you show up any other night of the week - and an automatic discount of twenty percent give or take if you commit to a week or more. With suites, however, we have to have the MLOS to make the numbers work. Hotels - especially at the lower and mid-market price tiers - are still figuring out how to use and market their suites. In a cheap property, a suite is just a bigger room in a lot of cases, that a guest can pay more for, and few guests do. (Why should they? It's like buying a VW Jetta: you can get one fully loaded with all the options but if you're going to spend that much money, forget it - go on ahead and get the Audi.) Whether it's a luxury hotel or a cheap, older property, the suites usually aren't that much more luxurious than regular rooms in that same property. The only way it's going to rent at all is if it has something in it that isn't found in a regular room, or if the guest needs the space for some reason, or if every hotel in town is full and those are the only rooms you have left. In a hotel with both rooms and suites, the suite might be fixed up a little nicer, with extra amenities (e.g., a whirlpool tub). But that's the one factor you can control consistently: does the suite have something in it that adds value that justifies the higher price? Otherwise, unless you have an all-suite property that's marketed primarily to extended-stay guests, there's a cheaper alternative right there in your own building. For a stay of only a few days, anyone can tough it out in a regular room at a lower price. Nowadays, we have a pretty good idea how to make good use of suites, but the marketing methodology is still evolving. We've learned over time that suites work best for extended-stay guests: people who are going to be there several days (for one or two nights, anyone can make do with a regular room). So, the pricing structure that includes the minimum length of stay requirement, and the 'drop' for a lengthy booking, encourages this use. That's how all-suite hotels succeed. Their margin is lower, but enough to cover their costs, and their occupancy rate is higher (90% give or take, by contrast to 60-65% in a hotel where more standard rooms prevail). A suite does really nicely for business travelers, especially if they bring people up for a meeting or conference: they have their meeting in a nice clean living room with no clutter, everyone has a place to sit (besides the edge of the bed), and the visitors don't walk past the open bath where items from the guys ditty bag are still spread over the vanity top or the mirror is still steamy from the shower. A woman traveling on business particularly appreciates this quality in a suite: she can talk to some guy without having him looking over her shoulder at the bed during the entire conversation . . .
Hotel Impossible star Anthony Melchiorri advises, when traveling with your family if you have children, always ask for connecting rooms. These are adjoining rooms with a connecting door between them: rent both of those rooms to a single party, and they can walk from one to the other without going out in the hall. Most hotels have some, older hotels have (I feel) too many. There is a growing exception - our hotels. We don't like connecting rooms, demand for them rarely matches supply, with very few exceptions we don't design them into our new hotels, and we get rid of them and board up and plaster over the connecting doorways as we remodel the rooms on our older ones. The (hopefully) locked connecting door detracts from the appearance of the room to a guest who rents only one of the two connecting rooms, and provides soundproofing and furniture placement (and sometimes procurement) challenges in the rooms affected. Most of all, while we stay on our staff to be careful and check them and seal them every time (we'll affix a sticker over the crack to show that the locks have been checked: if you check in and the sticker is broken, call the front desk immediately), connecting rooms are a security hazard made by Satan himself. They can, if left unlocked (you'd be surprised how often they are) or tampered with give anyone with access to one of the rooms access to the other. (The tragedy at the Hampton Inn in Crestwood, Ill., that precipitated the Nan's Lawcampaign was facilitated by access to Nan's room via a connecting door from an adjacent room that had been previously tampered with by the maintenance worker who was eventually charged and convicted.) And ultimately, we don't really need connecting rooms. (I've been in this business nearly thirty years, I can count on my fingers the number of times I've been asked for a pair of them, only once have I ever lost a sale for lack of one, and I suspect what that guy was really unhappy about was the rate.) If you're traveling with your family and you need two rooms, what you really need is a suite, right? We have them. Suites are just what the good Lord provided for family travel, not connecting rooms. I'd bet if Anthony Melchiorri showed up with his wife and daughters, even he would agree. Suites can be themed (not that there's anything to stop you from decorating a regular room, or even an entire hotel, in accordance with a theme), and the range of possible themes is limited only by any one person's imagination. However warped that imagination might be: the manager of one cheaper hotel back in the nineties - who had an odd sense of humor, but knew how to hit on a gimmick - had an oversized 'Presidential Suite'. Identifiable from the outside only by a plaque of suitable quality and dignity, it had dark wallpaper, subdued 'mood' lighting with a bedside rheostat control, mirrored ceiling over the waterbed, a variable speed revolving globe light like you'd see in a disco, blue carpet with the wide, clashing red and white borders similar in appearance to the carpet pattern in the Oval Office during the Clinton administration; a nice, framed picture of Monica Lewinsky on one wall and Gennifer Flowers on another (there was one of Hillary in a cameo frame mounted over the toilet), and even a pair of kneepads left on the credenza with the Presidential Seal ironed onto them. It's probably no longer there - today, Clinton's second-term troubles are old news - but whenever he didn't have it booked at a good rate, he was able to charge people five bucks a head who came to the hotel just to see it and get a laugh, especially after someone complained to the paper about it, only to have the paper send out a photographer and do a photo spread, followed by ensuing controversy on the editorial page that lasted a few weeks . . . And the 'Presidential Suite' at that hotel stayed booked, well into Bush's term, enough to pay for itself and all of its gimmicky amenities. Guys would show up who didn't ordinarily book suites, or rooms with waterbeds and jacuzzis, and ask for that one just so they'd go home with a story to tell, and word got around accordingly . . . More than once, a guy showed up wanting it only to learn that it wasn't available, it was rented to someone else, so that guy had to settle for a regular room and try again next time, increasing the hotel's overall occupancy . . . So, while hotel rooms (and suites) have been around for years, suites are a new thing (at least in smaller, mid-market hotels), and while they've found their place in such properties, the possibilities for them remain endless. That's why I like them. I'll learn to like them when I can figure out a way to design one so that you can open the drapes and consistently get natural light into both the bedroom and the living room sections. All it is is a longer, 12-foot room bay with a semi-separate sitting area containing a sofa bed and a chair and - maybe - a mini-kitchen (small refrigerator, microwave, bar sink: you can't count on much more, sometimes you don't even get that). That's why I say, they don't count as real 'suites'. This one did a better job with the lighting - but at the expense of minimizing that half-wall so that there's hardly any separation at all between the living room and the bedroom spaces. Such separation that does occur is obviously fake: that arched cased opening that you keep seeing in so may suites of this type in so many properties is an architectural cliche that gets very tiresome to look at. But without it, the separation and definition between the two spaces would appear to be even less . . .
Another thing that people are still figuring out about suites is how to price them. Everyone is still experimenting with how to calculate an appropriate amount for the 'drop', the automatic discount that occurs if you commit to a say of however many days. Even with suites at a Marriott-branded hotel (Residence Inn, TownePlace, Spring Hill), frequently the drop isn't that much: for some properties and units, you can stay two weeks or more and only save twenty bucks a night. That's too little. But it works for them, so they'll keep doing it and I don't expect them not to . . .
With a lot of Comfort Suites, and even Best Westerns, a drop doesn't occur at all: you're just paying the same rate per night for a longer 12-foot room bay with more amenities, regardless of how many nights you stay. That's another reason why I say, 'shotgun' suites don't count as real suites. It is most frequently in properties where these prevail that there is no drop at all for a stay of several days. On the other hand, Wyndham brands - Wingate, Baymont, Ramada, Days Inn, even Super 8 - are trying a pricing structure where there is a drop of 10% for two nights, 20% for three or more (click on any of their websites, and click on the 'Discounts and Deals' links). That's too much. It's unsustainable. It can't last. To do it on a $59.99-per-night room at a Super 8 motel or an older, run-down Days Inn, you have to be prepared to rent that room for $47.99 per night, and hope that covers your cost. Or, in most markets, you have to increase your $59.99 per night rate to something closer to $69.99, so when you rent that room for only eighty percent of your rack rate, you end up with $55.99, which in a $59.99 property is maybe doable - but then, you're pricing your nightly rate so high that your customers will walk away. (At that price tier, margins are very low - unless the owner is letting his property run down. And one of my recurring rackets with hotel franchise organizations is that they're all so full of the milk of human kindness when it comes to handing out discounts like candy to everyone who schleps in the door - so long as it's the franchisee, the hotel operator, who actually has to provide the discounts.) So, I don't expect Wyndham's pricing structure for these hotels to last, at least not for the cheaper ones. The Wyndhams, the Wingates, the Hawthorn Suites, maybe. The Days Inns, the Super 8's, the Travelodges, the Howard Johnson's, no. Still, it goes to show, hotels are learning, and more hotels will learn, the virtues of charging less for suites - and rooms - in which the guest will stay several nights as opposed to just one, and including things in the suites besides just additional space. I simply suspect that it'll be awhile before the amount of that drop is predictable from hotel to hotel.